Being poor in the United States is so hazardous to your health, a new study shows, that the average life expectancy of the lowest-income classes in America is now equal to that in Sudan or Pakistan. Among men, that gap is 15 years, roughly equivalent to the life expectancy difference between the United States and Sudan. 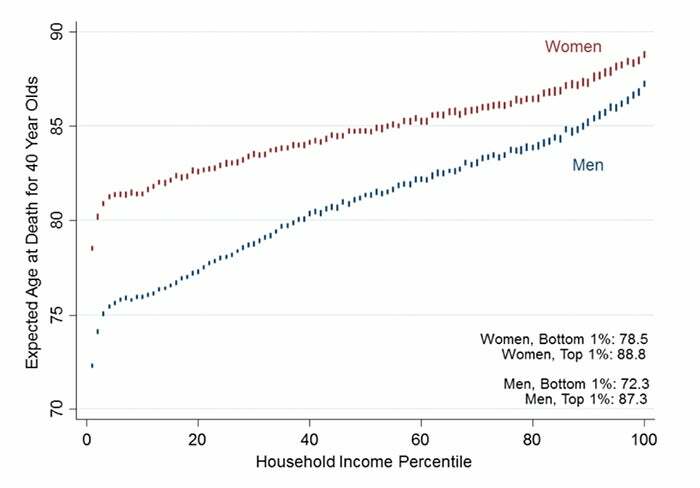 For women, the 10-year difference between richest and poorest is equivalent to the health effects from a lifetime of smoking. The study is described in a paper published in the Journal of the American Medical Association online on April 11. “This paper really has two missions,” said Cutler. “One is to present this data, but the other is to create this data set so it can then be used by policymakers and researchers everywhere. This data has never been looked at with this level of granularity before. Cutler and his co-authors, including former Harvard Economics Professor Raj Chetty, now at Stanford University, collected federal tax records from 1999 through 2014, and sorted people into 100 percentiles according to income. By matching that income data with death records, the researchers were able to calculate the mortality rate and subsequent life expectancy at age 40 for each income level. While researchers have long known that life expectancy increases with income, Cutler and others were surprised to find that trend never plateaued. Cutler and Chetty then examined how life expectancy changed over time, and found that while life expectancy has increased for the wealthiest, it has edged up only slightly for low-income Americans. When they laid the data over maps of the United States, Cutler and Chetty again found unexpected results, with low life expectancy concentrated not in the Deep South, but across the Midwest Rust Belt. Going forward, Cutler, Chetty, and their co-authors have made the data publicly available in the hope it will spur further research into whether certain public policies or other economic indicators are associated with longer life expectancy. Cutler believes it also underscores some worrying truths about economic disparity in the United States. The research was supported by the U.S. Social Security Administration by a grant to the National Bureau of Economic Research as part of the SSA Retirement Research Consortium, the National Institutes of Health, the Social Sciences and Humanities Research Council of Canada, the Smith Richardson Foundation, and the Laura and John Arnold Foundation. Early in her research, doctoral candidate in sociology Caitlin Daniel said, "It became clear to me that lower-income respondents minimized the risk of food waste by purchasing what their children like. And often children like food that is calorie-dense and nutrient-poor."